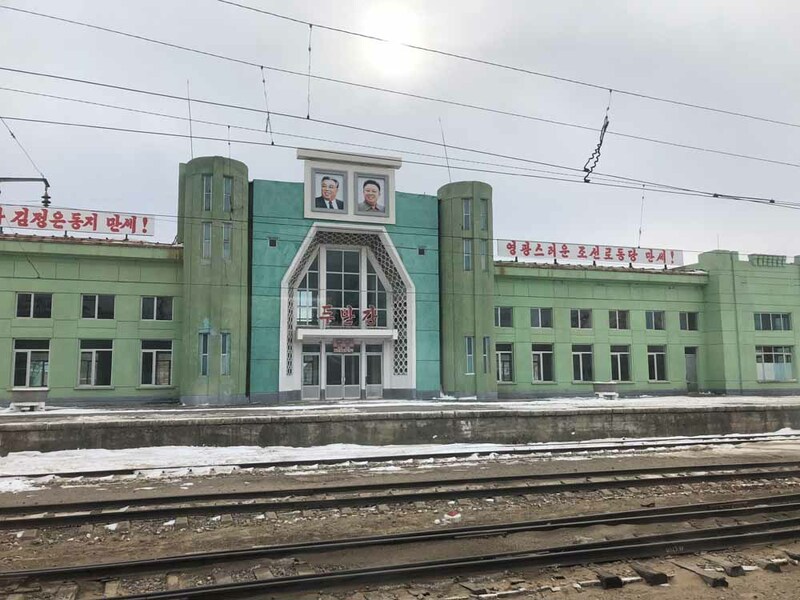 North Korea, where tourism is tightly controlled and visitors must be accompanied at all times by two state-employed guides, has almost never allowed foreigners to take the train from Pyongyang to Russia. 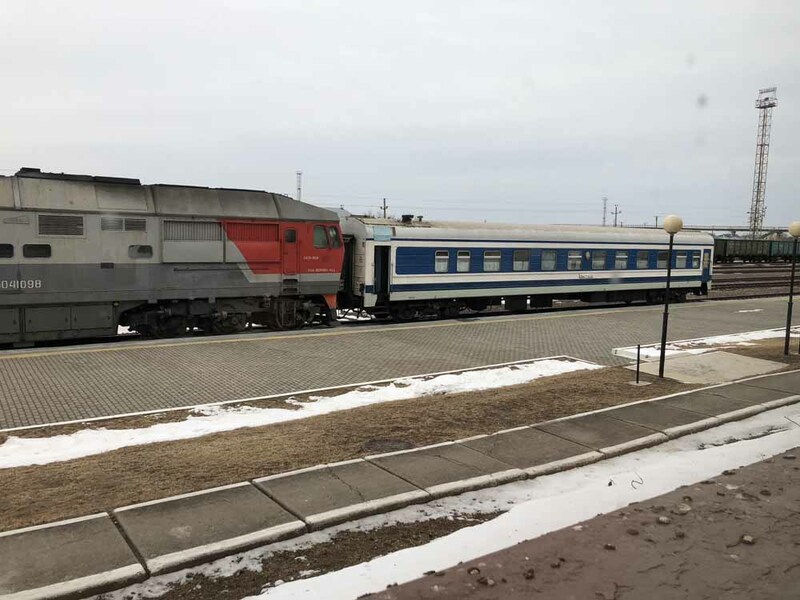 Knowing this, it’s with some excitement that I board the train alongside a small group of fellow travellers on a freezing March morning for the start of a multi-day journey to Vladivostok. The train that sporadically makes the journey all the way to Moscow is actually just one single carriage. 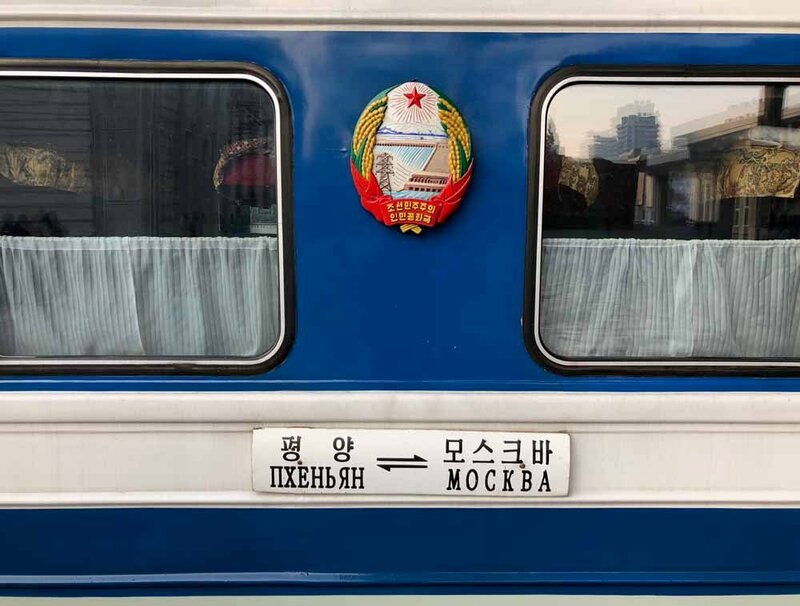 It’s in noticeably better condition than the other 14 carriages it’s coupled to in Pyongyang; these crumbling items of rolling stock only go as far as the northern city of Chongjin and so don’t need to look impressive — a role they fulfil with some flair. 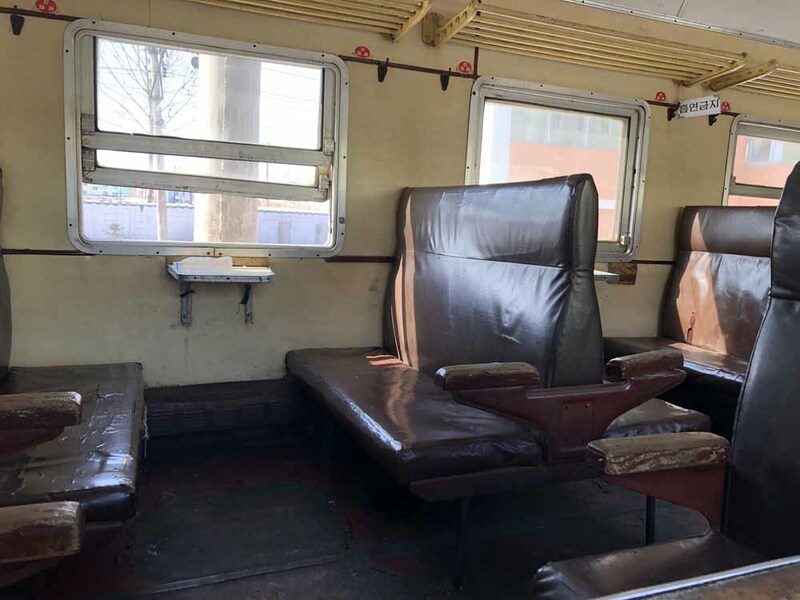 The solitary international car is by contrast branded “first class”, and although it’s what would be considered a second-class sleeper carriage in Russia, it’s notably clean and well upholstered inside. The snow-covered landscape rises quickly beyond the city limits and remarkably similar villages pepper the view from the train. Each has low-slung traditional-style houses that are shared by two families and arranged in neat rows, all enclosed by one large village wall. The bigger settlements also have a few squat blocks of flats, painted in once bright, but now faded and flaking colours. 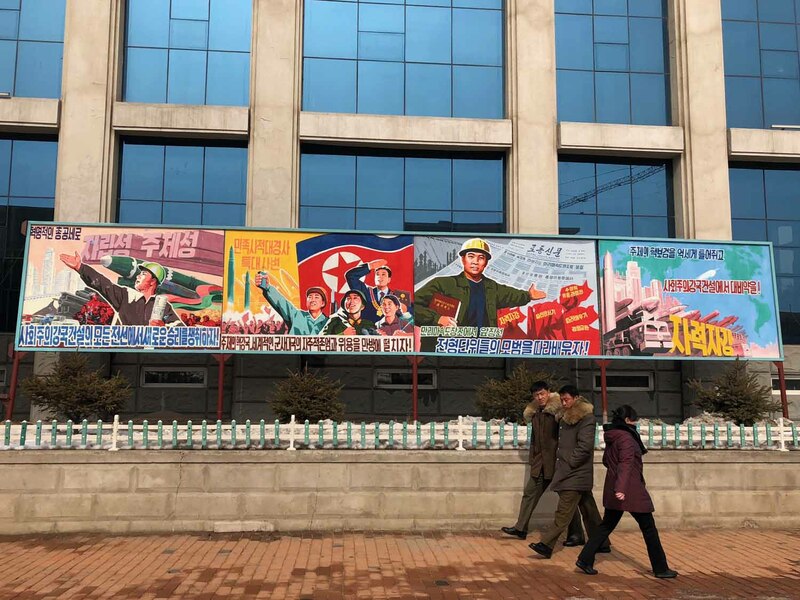 Propaganda posters, red flags in the frozen soil and huge banner slogans can be seen everywhere. The people we pass have wind-blown faces, raw from days doing manual labour in the fields and contending with the Arctic winds. Anyone who catches my eye as they watch the train pass looks nothing less than astonished to see a foreigner in this ethnically homogenous land. Most look away immediately, though every now and again someone smiles. 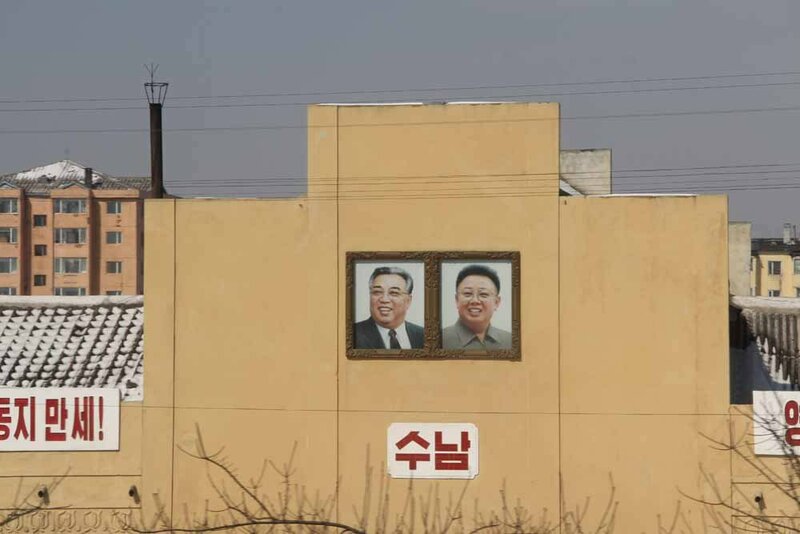 Every station along the way is almost identical, with two giant portraits of Kim Il Sung and Kim Jong Il hanging on its exterior, both smiling incongruously against the bleakness of their surroundings. 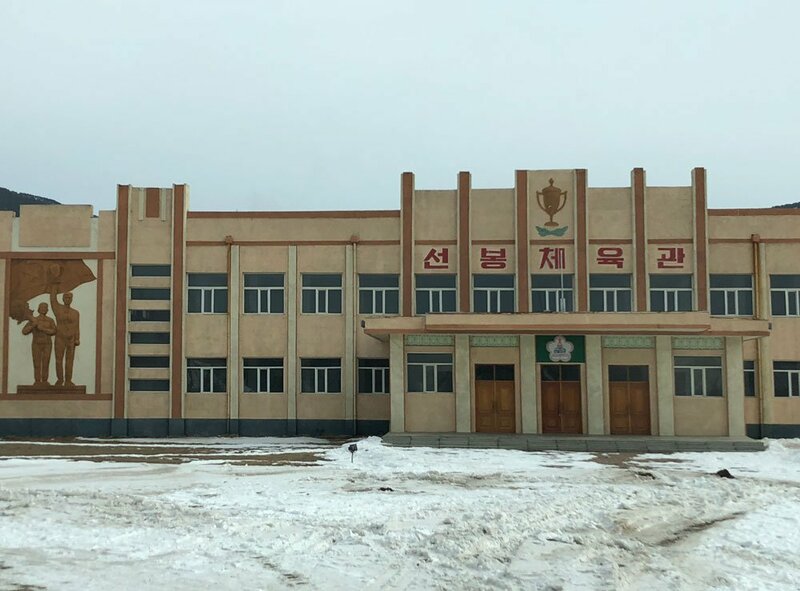 Leaving Pyongyang’s grand architecture, showcase avenues and spotless public spaces for the unvarnished reality of North Korea’s countryside is a sobering experience. 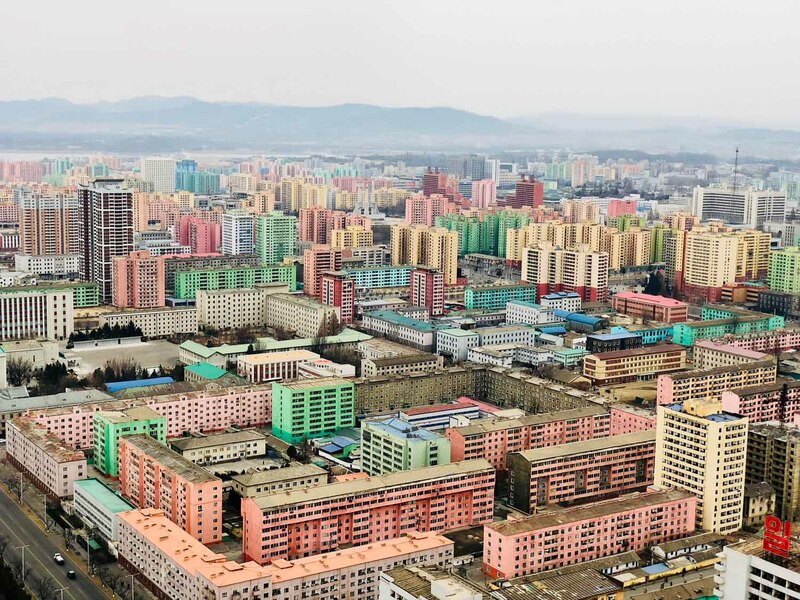 Despite years of sanctions and increasing international isolation, Pyongyang looks wealthier in 2018 than I have ever seen it in 15 years of travel to the North. There are enough cars on the roads to actually justify traffic lights, a surprising number of food stalls, shops are well-stocked and people look better dressed and healthier than they ever have. 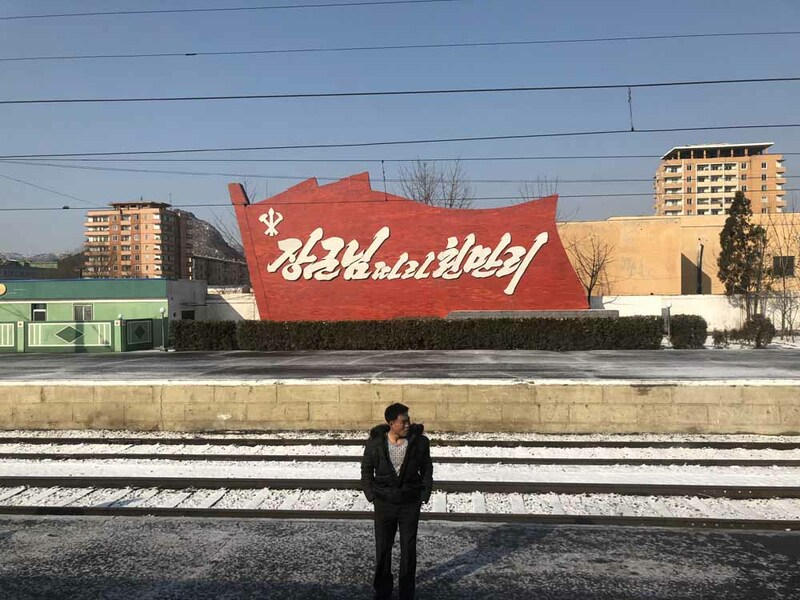 But once the train rolls past the industrial belt around the capital, it’s a story of grinding poverty that clashes with the official image projected in Pyongyang. 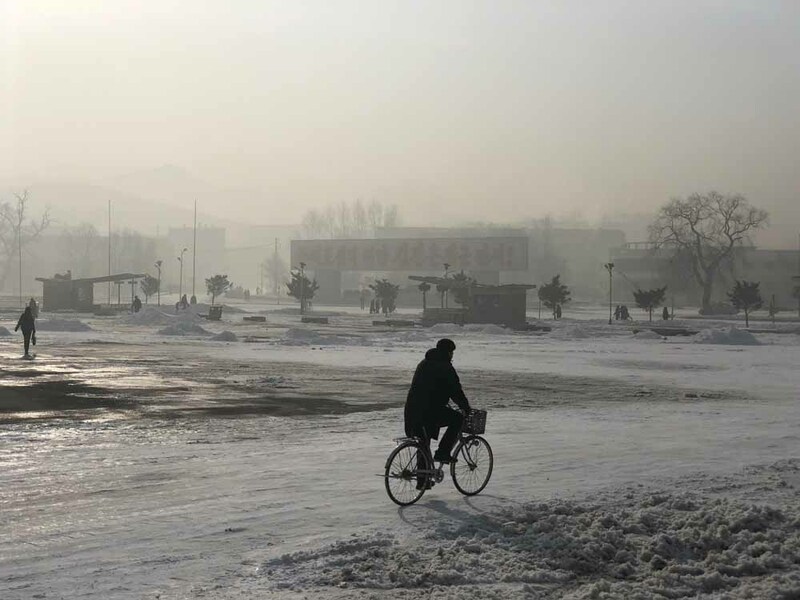 After a day watching the stark but compelling landscape passing us by, we arrive in Hamhung shortly after nightfall. 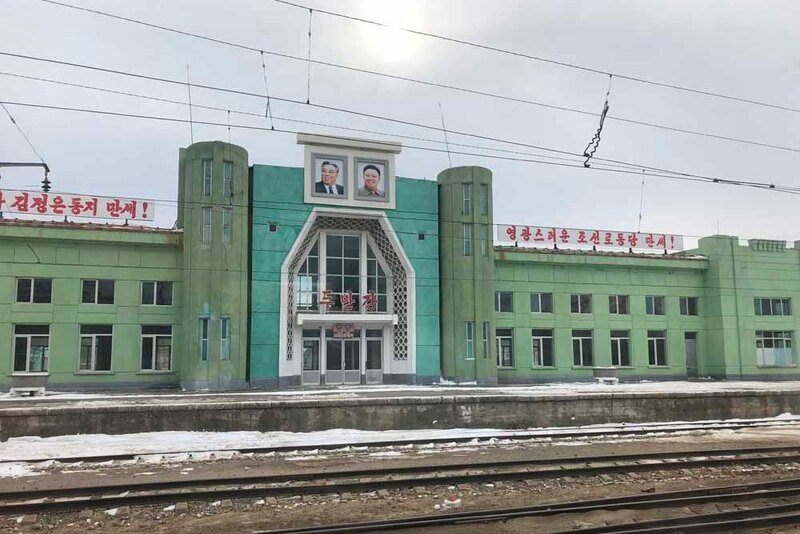 This is North Korea’s second city, but its train station is illuminated by just one lamp. The conductor allows travellers in the international car to walk about only at some stops, and this is one of them as we have an unusually long 10-minute stop. It’s thrilling to be in the darkness, where for once locals — I imagine — are not staring in amazement at the foreigner standing on the platform. As soon as I step away from the faint light of the train carriage, I’m swallowed up by the black ink of the night, and imagine how easily I could simply wander out into the city unperceived by anyone. 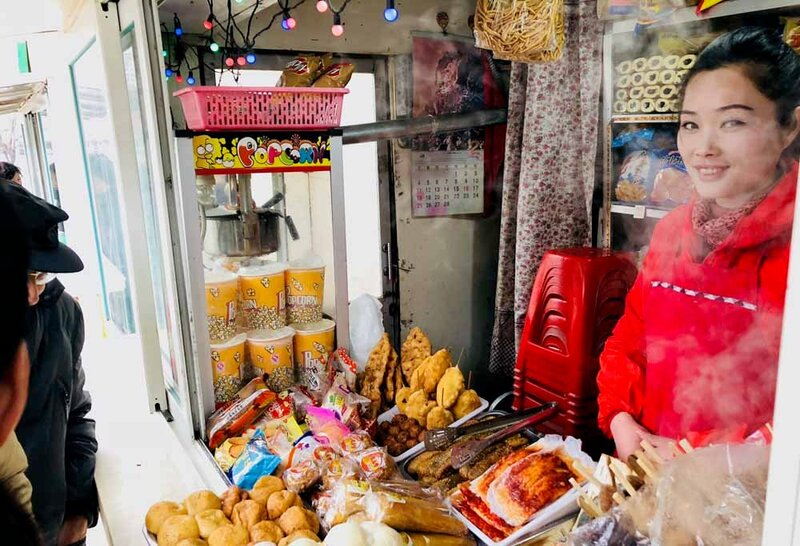 It’s the nature of travel in such a closed and tightly controlled country that the most perfectly mundane action — walking down a side street, entering a shop — becomes a tantalising prospect due to it being essentially impossible. But instead of disappearing into the blackness, I return to the train, to the relief of my guides, and we continue our journey overnight. There is no restaurant car on the train, and so the passengers in the international carriage spend much of their time grazing on the products available at the Kwangbok Department Store in Pyongyang, preparing dried noodles using the samovar at one end of the carriage and offering sweets and pieces of fruit to each other. 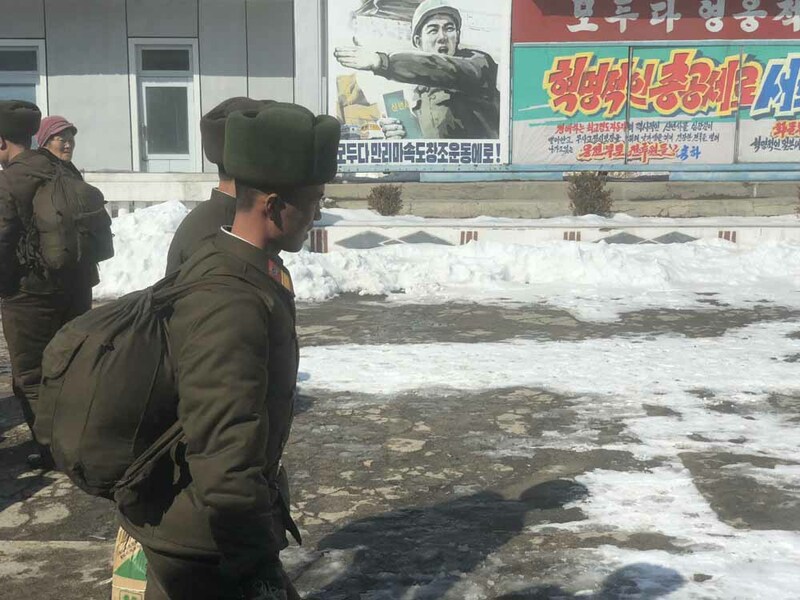 The team of North Korean loggers on their way to Khabarovsk in the cabin next to mine offer me frozen persimmons and then, on discovering from another traveller that it’s my birthday, present me collectively with a cucumber. The passengers travelling in the normal carriages have things far rougher. 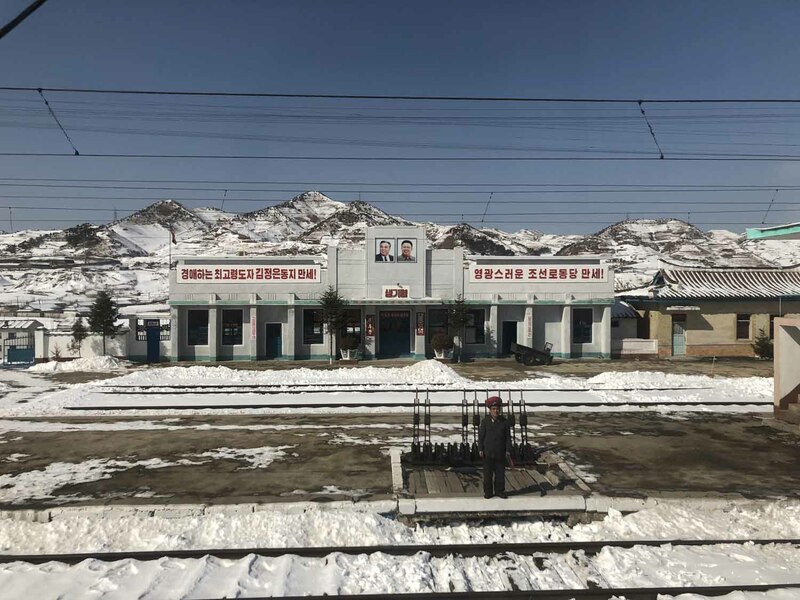 When we pull into Kyongsong station the following morning, scores of travellers pour out of the train, dishevelled and dirty, and hurry to piles of snow, which they grab in powdery fistfuls to clean their face and hands with in the few minutes before the whistle goes and the train continues its relentless push north. 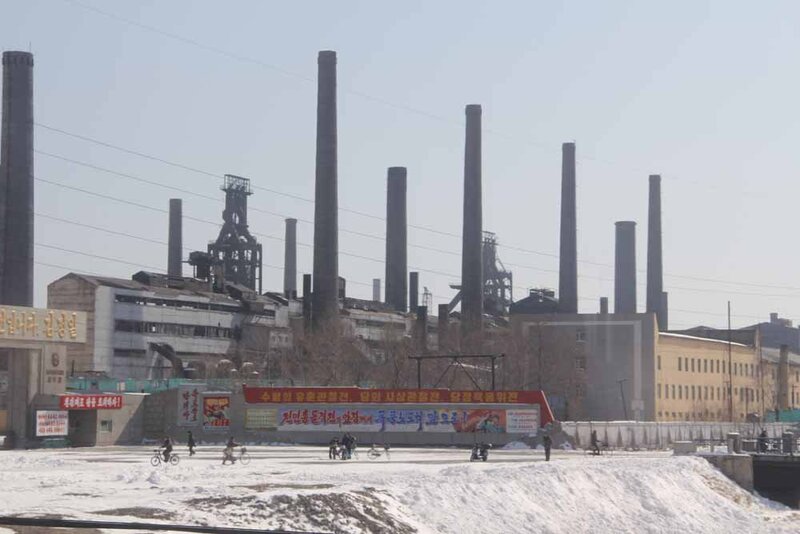 By the end of day two, we reach Chongjin, a gritty and industrial city characterised by a ring of huge factories that belch smoke into the atmosphere. 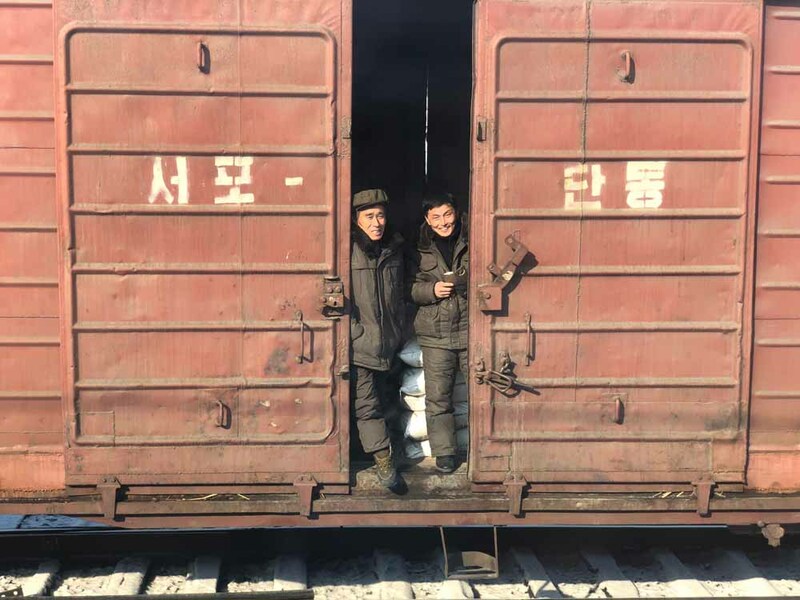 Here our sealed car is decoupled from the rest of the train and attached to a single locomotive that judders onwards to Rason, the last major town in North Korea before the Russian border. We reach Rason shortly before nightfall, and we break for two nights here. 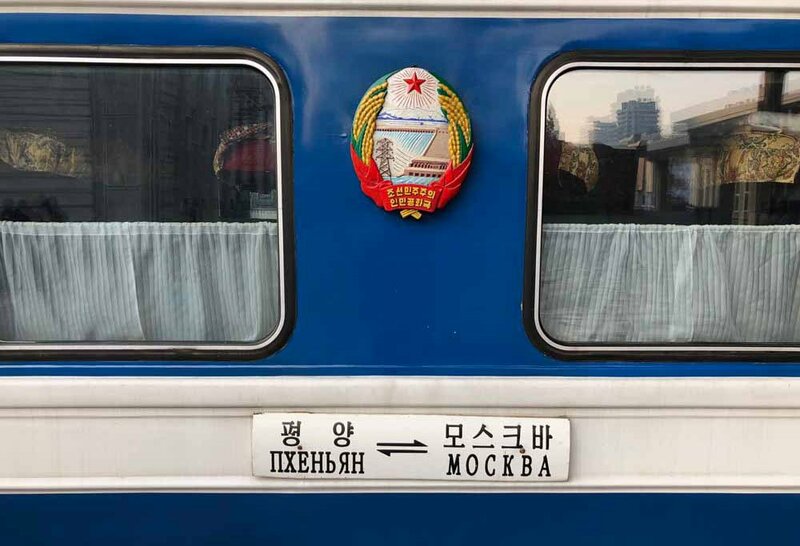 The single carriage will wait for us — North Korean infrastructure being so bad that the Russia-bound train leaves Pyongyang 48 hours before it needs to in order to be sure it can make its connection with the Trans-Siberian railway in time, as break downs and power cuts are common. 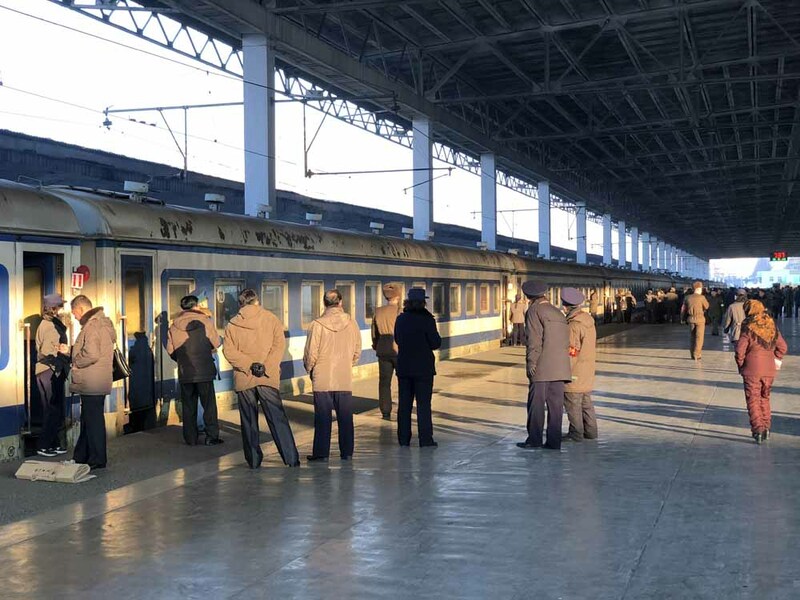 While the loggers stay on board the train carriage, my group and I are off to spend two nights in the city, which is part of a North Korean Special Economic Zone. Here, Chinese banks and hotels can be found, as well as a large Hong Kong-owned casino where many Chinese come from just across the border to gamble, something that is banned in the People’s Republic itself. 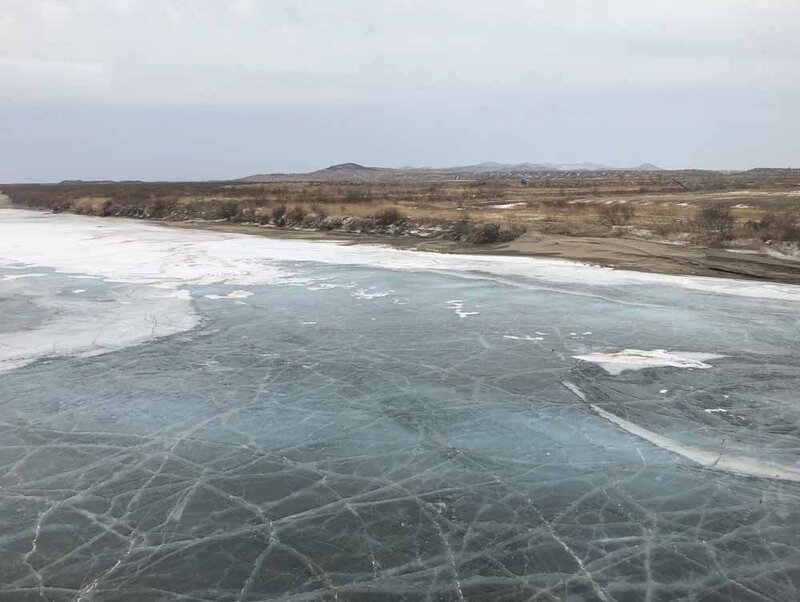 Two days later and we rejoin the train again, pushing on to the border zone at Tumangang, which looks like the end of the earth. Its one dirt street is lined with decaying buildings — only the train station is in any kind of decent state — and the only traffic is made up of soldiers on foot and farmers driving oxen to the fields. The border checks are lengthy and unfriendly. 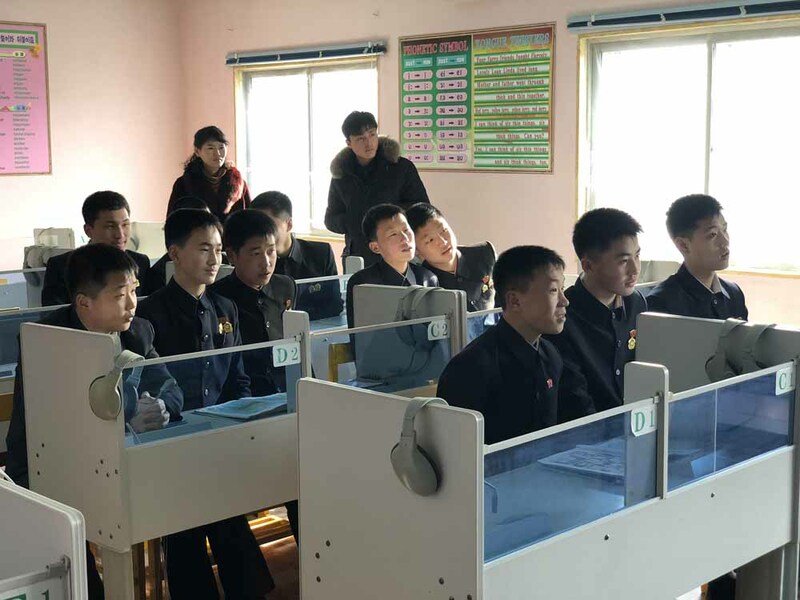 A Russian railway engineer who has been working in North Korea for three years seems amused to have company crossing the border. Indeed, this may be the least used open border in the world, and the sense of excitement is growing among the few destined to cross it. The train finally lurches forward; creeping in fits and starts towards the heavily secured bridge that crosses the wide Tuman River. Soldiers guard the track, while others search the train’s undercarriage for stowaways. 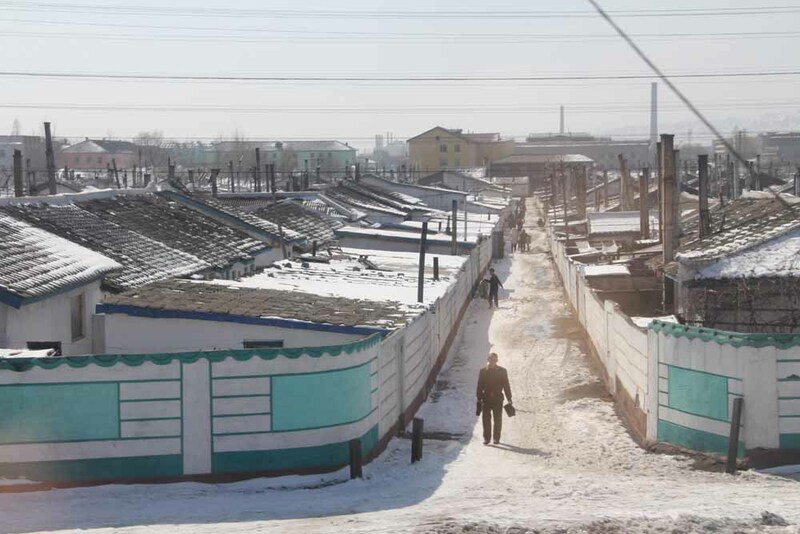 The silent Tuman River, icebound and grey, glides below us as the train trundles into Russia, and after the scowling faces of countless North Korean soldiers and officials, it’s a great source of happiness to see the lone Russian customs agent and immigration officer waiting at the train station in the small border town of Khasan. They looked distinctly puzzled to see foreigners coming across the river. “Can we expect lots more of you in the future, then?” the customs officer asks. It may be quite a wait. Tom travelled with Koryo Tours. You can follow his travel adventures on Instagram.